Although there is no single ‘formula’ for writing hit songs, there are essential elements and conventions that are consistently found in the structure, melodies and lyrics of all hit songs. And the way in which these key components are built into a song can have a significant impact on its level of success. Crucially, it can make the difference between an average song, a good song … or a great song. For example, as well as combining vital elements such as an attention-grabbing title, a memorable melody, an unforgettable hook, and lyrics that make an emotional connection with listeners, it’s also essential to put these elements together in a way that satisfies people’s subconscious desire for symmetry. Scientists say practically all laws of nature are based on symmetries, and symmetry is deeply ingrained in humans’ inherent perception of everything—from physical objects to the shape of people’s faces to the music we listen to. That’s why songs with a well-balanced shape are more satisfying to listeners’ ears. If a song and its components lack this essential symmetry, it can subconsciously influence a listener’s opinion of the song. Any imbalance will make it harder for them to follow the song when they hear it for the first time. For example, award-winning Swedish songwriter, producer and hit machine Max Martin is known for putting a firm emphasis on the way an identical number of syllables in a lyric line can underpin a melody. One of his songwriting partners, Bonnie McKee, has described Martin’s approach as “very mathematical”. Similarly, ‘hit’ components need to be assembled in an inventive and original way that still makes a new song sound kind of familiar to listeners without it being similar to anything that has gone before. This subconscious ‘familiarity’ works to put listeners at ease when they hear a new song for the first time, so their ears are more receptive to it. The Hit Formula website aims to provide aspiring songwriters with expert advice on the essential ingredients of all hit songs—along with tips on how to steer clear of the many songwriting traps that new writers can easily fall into. This website is produced in association with Big 6 Publishing which publishes the 5-star rated book, “How [Not] To Write A Hit Song! 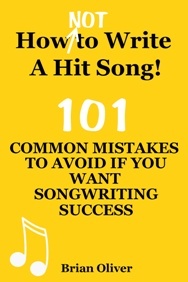 – 101 Common Mistakes To Avoid If You Want Songwriting Success” … and also “How [Not] To Write Great Lyrics! – 40 Common Mistakes to Avoid When Writing Lyrics For Your Songs”. Written by experienced music publisher and music consultant Brian Oliver, both books highlight the most common errors that are made when key musical and lyrical components are built into a song. They show writers who are just starting out how to avoid such mistakes in their own songs and lyrics.